When you’re all dressed up for a night on the town, the last thing you want to take with you is a purse filled with the stuff you carry around all day. So leave it home! That’s right — ditch the daily planner, the Tic Tacs, the hairbrush and even the bulky wallet. Your cell phone doubles as a mirror for checking lipstick and holds your calendar, your address book, and phone numbers. It even plays music if you become bored with the cocktail party conversation. Pretty soon, phone cases will be just like shoes — a fashion accessory you choose depending on your mood, your outfit and where you’re going. Whether you’re at a formal gala or just grabbing a bite with your spouse, check out these fashion-friendly phone cases for a sleek, super-glam look. The PurseCase is a silicone case with a chain handle you can wear as a bracelet, making it a perfect accessory for a cocktail party. It holds your iPhone 5, 5c or 5s in style and frees up your hands to hold that glass of wine or nibble on an appetizer. 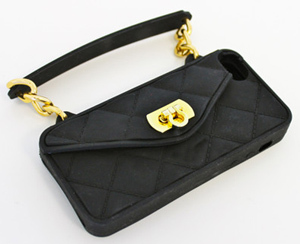 The quilted design on the front of the PurseCase makes it resemble a Chanel bag. It’s made of silicone and comes in vibrant colors such as black, pink, purple, white, teal and neon yellow. The front clasp opens to reveal a tiny makeup mirror and a slot with room for a few credit cards, some money or your ID. The other side of the case is open, leaving your phone available for sending a quick text or snapping party pix. Those who prefer a wallet-style case will appreciate the style and simplicity of the Mrya iPhone case from Mapi Cases. Its soft leather protects your phone on the outside, while allowing access on the inside to all your phone's important features. You can easily reach all the functions of your phone, such as camera and charger, while it’s cradled in this elegant leather case with a soft interior fabric. The left side of this case has three pockets for holding money or credit cards and an ID. The case itself uses a snap closure that doesn’t add much bulk, so you can still slide it into a pocket if need be. The Myra comes in lime green with white stitching and, just like some leather shoes, it comes with a really nice drawstring pouch for storage when you’re not using it. This clutch-style case is perfect if you need to carry a little more than a phone and a credit card yet don’t want to carry a purse. 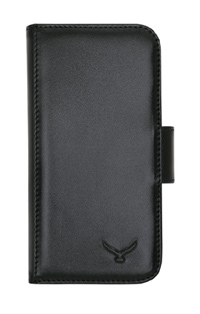 This phone wallet is made of black Saffiano leather, so your phone is safe and protected while looking elegant. 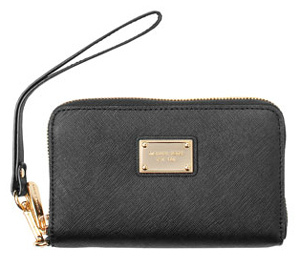 The wristlet strap, which is attached via a gold clasp, is removable. The inside, also made of leather, offers three slots on one side for cards and ID, plus another sleeve on the opposite side for cash or perhaps a key. The middle section is designed for your iPhone, nestling it between two layers of leather. Keep in mind you can’t fit your phone into this space if it's already in another case, no matter how slim the form factor. I tried, and it's very difficult to get the phone in and out. This case will, however, hold any iPhone. The thin profile of the case leaves a tiny bit of room, just enough to fit a small lipstick on one side. Score! 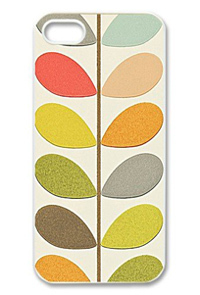 If you’re looking for something simple and pretty to hold your phone, check out the Orla Kiely collection from Belkin. It’s part of textile and fashion designer Orla Keily’s line of fashion cases made for Belkin and Target. There are four designs to choose from (Abacus, Multi Stem, Optic Stem and Wallflower). We liked this simple floral wallet-style case. The inside is lined with soft microfiber to protect your phone from bumps and scratches. There are the usual pockets for credit cards and money and a snap to secure the case closed. Easy access to charging ports and phone functions make this a convenient, fashion-friendly phone accessory. A friend recently got an iPhone 5 (I have a 4, so no Siri). I gave her a stylus; I got a 10-pack, so I had one to spare. She wants a case with storage for the stylus. Yesterday, I saw a stylus that plugs into the headphone jack, but she needs her headphones.